As a matter of untrained, meager observation, it's somewhat safe to say that the sacrament of the Lord's supper is receiving some long-over due attention in orthodox reformed churches. Perhaps it is due to a strengthening of John Calvin's influence, versus his reformed predecessor Ulrich Zwingli, whose legacy is a bit more narrow to our faith. Zwingli seems to have been a bit of a reactionary -- being so adamant in his opposition to Rome that he preached a mere symbolic presence of Christ in the sacrament of the Lord's supper, becoming an arch rival of both Rome and Luther. A lesser known fact is his influence on frequency of celebration. One can only assume that it was his passion for the centrality of preaching in worship that led him to endorse a quarterly observation. 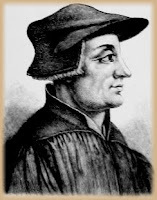 Zwingli, according to some, even wanted to cease using the word "sacrament," sensing that the popular meaning was too subservient to Roman Catholic convention. Is it possible to say, perhaps, that Zwingli's influence was physically cut short by his tendency to over-react? He did, after all, die in battle against am army of Roman Catholic soldiers in a fight he was partly responsible for provoking. Calvin's legacy has probably done more than anyone to create a cohesive and balanced view of the supper, not the least of which, on the issue of frequency of administration. But, correct me if I'm wrong, it has taken an awfully long time to take hold. The American evangelical tradition didn't do anything to help, neither did the Scottish Presbyterians, who's annual-at-the-most model of frequency may have been, as some speculate, an over-reaction against and an attempt to distinguish themselves from the Church of England. The Dutch Reformed tradition (within which I now commune) seems to, by and large, be dealing with a Zwinglian tendency when it comes its implicit ideas about the supper. On the one hand, this tradition tends to fence the supper better than most, leading one to think it has a "high view" of the supper. But on the other hand, it also tends to celebrate the supper with might-as-well-be-never frequency, leaving the impression that it doesn't understand the supper's value. So history is littered with errors and various erroneous reactions to error. And while I've personally been longing to see a greater and fuller understanding and of the supper among my brothers and sisters, I've been a little hard-pressed to identify with various concerns among those who justify the infrequent model. There are some arguments I won't ever understand, such as the one which bemoans a careless and trivial attitude that MIGHT accompany great frequency. However, there was finally one anecdote given me recently by my pastor that did encourage me to be watchful of how I treat this topic (it is, after all, a subject that is not dealt with explicitly in scripture). It involved a young man who, although not a member, sometimes visited our church. After every morning service, he would rebuke my pastor to his face for not including the Lord's supper in the liturgy. The man treated the supper as a mandated part of regular worship. Now, I won't deny that I would like it to be possible for our church to be that frequent, but this man treated it as a matter of sin to not include the supper. Over-reaction anyone? Should that sacrament have parity with the preaching as a primary means of grace? No. There was also a glaring inconsistency in the young man's reasoning which pastor pointed out to me: While he thought weekly observance was mandatory, declaring worship incomplete without the supper, he didn't seem to endorse celebrating twice each Sunday, a must if his view were to be consistent. I'm hopeful that the reformed churches as a collective will continue to "reform," in the sense of restoring the supper to its rightful place in our church life. 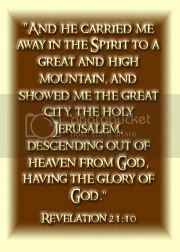 It is, after all, intended for the benefit of the believer in pointing, in a physical sense, to Christ. In this way, we do indeed spiritually feed on Christ. Yes, heaven forbid we enjoy Christ too much. :) We started celebrating the Lord's Supper weekly at Franklin Square about six months ago. I'm so thankful. And no, it has not become common place in the least. Amen. The non-member you mentioned...disrespectful to say the least. But I'm curious: why must his view necessarily include two worship services? Single best book on the subject is "Christ, Baptism and the Lord's Supper" by Leonard Vander Zee. He's CRC, so there was one paragraph I objected to. Otherwise, it is the single greatest tome on the sacraments. Period! Hey Beka, miss you too! It's not much of a stretch for a Orthodox Presbyterian to celebrate weekly -- with no cumbersome form that attempts to be a systematic review of all that we believe concerning the supper (but fails btw), it's a simple matter to celebrate more often. Add to this a "preparatory week" which has its origins in Geneva, thanks to the city council, not Calvin. The problem in the reformed tradition is that many would see a move from the form or preparatory week as a sign of danger, as if we are on some kind of slippery slope to misusing the supper. I know one minister (not our own), who decided to test his congregation by reading the scriptural passages behind the preparatory form instead of the form. Sure enough, some complained. Amazingly enough, some actually thought it was better to read a man-made form over inspired scripture. The "disrespectful" person referenced in my post was inconsistent because his argument was that all sabbath day worship required the supper. And yet he had never considered the fact that he, in his own mind, was only endorsing one service per sabbath, based on an argument that would require both services to include the supper. Robert: I can't believe how many book recommendations I've accumulated in the last week. You will have to make sure you fill me in on the particular problematic graf in book if and when I happen to acquire it. It was very difficult for us to adjust from the OCRC's quarterly to a PCA church's weekly. The prepatory forms did a lot of good. But as I read 1 Cor 11 in context, I find only a slight thread of what is the substance in most Reformed doctrine: bottomless naval-gazing! Communion is about unity, first and foremost. Wouldn't it be strange to attend a church where they sang only quarterly, or once a month? It would be ridiculous! But according to the lists in Acts, the Supper was even more central to early church worship than was song. I don't sin quarterly or doubt monthly; I need to be forgiven and assured constantly. Calvin repeatedly said "at least once a week"(Inst. IV,17,43-46). PS Congratulations, Dad Reimers!!! Casey just told me about Seth.